In the field of hiring and recruitment, a well-developed character is just as important as methods and approaches to finding and acquiring potential talent. Constantly practicing and developing positive habits are very important in becoming a most effective recruiter. In adapting to the calls of the time, you must first know what time calls for. These “adaptable” people can prove to be successful recruiters regardless of the social environment that they are operating in because they have the ability to adjust their techniques and methods to the calls of their business setting. The adaptable recruiters are the ones who have open-minds and are welcoming of new ideas and ways of going about things. In today’s age, technology is continually changing the way people go about their daily tasks. In recruitment, it is no different. The best recruiters know how to make use of technology to maximize their overall performance in scouting, hiring, and recruitment. Being tech-savvy enables recruiters to be more accessible, efficient and effective in their work. Basic technological amenities like owning a website, a social media page, or a hiring software are basic essentials in today’s business world. To lack any of these means that you aren’t being adaptable and you’re already one step behind your competition. The competitiveness of the modern age means only one thing: At all times, someone somewhere is working to get ahead. The most ineffective recruiters are those who slouch and get left behind in their work and are smoked out by their competition. The most effective ones are always managing their time and work effectively. Doing so means that they are maximizing their productivity throughout different points of the day. Developing and adhering to a schedule can go long ways in improving your productivity and effectiveness as a recruiter. There is a substantial amount of truth behind “The Early Bird Gets The Worm”. It didn’t become a popular phrase because of nothing; so stop being late in submitting your requirements and fulfilling your workloads. Those are recipes for being an inefficient and ineffective recruiter. A skilled individual can make a huge impact, but a group effort can make an even bigger difference. The effective recruiter realizes this and is equipped with well-rounded people skills. The best recruiters acknowledge that work can be done swiftly if different people involved in the recruiting process are all on the same page and working towards the same goal. That is why they are always armed with skills in coaching, organization, influence and group development. Always try to practice working with other people and make for productive professional connections with your workmates. Don’t be the kind of recruiter who tends to work alone and avoids group synergy. There is always value in having multiple minds working as one. In sickness, the best cure is always prevention. This should also be the case in recruitment. The best and most effective recruiters tend to avoid putting themselves in sticky situations by ensuring proper contingencies are set in place. They are always organized and they tend to plan out their tasks and projects with great attention to detail. In your field of practice, always make sure that your work is free from any loopholes or potential weak links. The best offense is always a good defense. Always practice being proactive. This is primarily what separates the good from the great. The good ones are content with their mediocre status and no longer find ways to progress. However, the great ones are constantly in a mode of self-assessment and self-evaluation. They realize that there is always room for improvement when it comes to self-development and they do the best that they can to progress as individuals. They are never content with merely being “okay” and you shouldn’t either. Always strive to be the best version of yourself by always constantly looking for skills to improve. This is what can help you become a highly effective recruiter. This is another very important habit that the best recruiters always tend to practice. To be a highly effective recruiter, you must learn how to distinguish between the important tasks and the expendable ones. A simple trick that you could practice is by writing down all the work that you need to accomplish throughout the day at the start of the day. Try ranking all your tasks from the most important to the least important ones; then try working your way down the list throughout the rest of your day. Remember, “priority” is synonymous with “important”. Learning how to prioritize is indeed a very important habit that you must possess. This is one of the most important habits that you must be practicing in order to become a highly effective recruiter. You must be driven by a vision of your work. Always try to see the bigger picture and work towards it. The small-minded are those who only focus on the mundane and trivial affairs of the workplace. The best recruiters are the ones who always tend to look at the grander scheme of things and have the best perspectives in their work. Always be driven by your vision as a professional and strive towards attaining that vision. 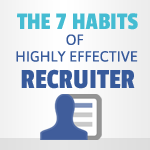 These are the 7 most important habits of a highly effective recruiter. Habits are important because they are what define your character as a professional and as a person. Just try practicing these habits on a more consistent basis and you will surely see a vast improvement in your overall character. What do you think of the post above? Let us know in the comments below. Thanks Jet. Really enjoyed the article.